On a wind-swept vineyard south of Sacramento, a small army of laborers armed with razor-sharp knives is fighting the next battle in California's wine wars. Prunings from last year's cabernet sauvignon crop lie in piles next to Jose Antonio Gonzalez and his crew as they make their way down the long rows of this 3,000-acre vineyard. Gonzalez pauses, then deftly uses his long knife to strip bark from a section of the woody vine. Sap wells forth like tears. Gonzalez slices deeper into the plant. He angles two pinot noir cuttings into the opening and then secures the graft with white plastic tape. Another worker seals the wound with tar. "You are seeing the creation of Charles Shaw Pinot Noir," Fred Franzia, chief executive of Bronco Wine Co. and father of the popular "Two-Buck Chuck," tells a visitor as they watch Gonzalez and his crew work. Once thought a transient artifact of a recent grape glut, Bronco's $2 wine has grown into a permanent fixture in the marketplace, now accounting for about 12% of the domestic wine shipped within California, said consultant Jon Fredrikson of Gomberg, Fredrikson & Associates in Woodside, Calif. Since the first bottle of Charles Shaw sold at a Trader Joe's market a little more than four years ago, Franzia's company has perfected the low-end wine business by whittling expenses in everything from vineyard management to cork purchasing. In the process, Bronco has become the Wal-Mart of wine — driving down costs and prices in a way that is shaking up the entire industry. "Until recently the wine business as a whole has focused on competing on quality and has not focused as much on cost," said Bill Turrentine, president of Turrentine Brokerage, a Novato-based grape and bulk wine broker. "But that's what Franzia has shown the industry. He exacts maximum efficiency out of the entire supply chain to produce inexpensive, quality wine." For $2.99, consumers can have Bronco's J.W. Morris Chardonnay. A couple bucks more will buy a bottle of the company's Black Mountain Pinot Noir. Last year, Bronco offered a $3.99 Napa Creek Merlot made by a Napa Valley vintner that found itself stuck with too much wine and sold the surplus to Bronco. There's even a sparkler, the $5.99 Almond Creek Vineyards almond-flavored bubbly. "I think this level of wine fills a real niche in the market," Cory Merchant said as he shopped the wine aisle at a Trader Joe's in Long Beach. Merchant said he could serve Shaw, Morris or any other Bronco budget wine to most of his friends and few would be able to discern any difference from more expensive labels. Others say there is a difference, but that the price can't be beat. 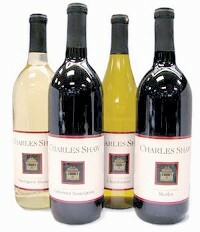 "Charles Shaw is a great bargain," Malcomb Davis said as he purchased two bottles from the Long Beach store. "It might not be as hearty as a $7 or $8 wine, but it is good." Whether they're buying it for the taste or the price, wine lovers are drinking about 6 million cases of Two-Buck Chuck annually. And Shaw's volume is likely to grow this year as Bronco adds new varietals to the lineup and Trader Joe's, the brand's exclusive retailer, continues a nationwide expansion, Fredrikson said. The company can exploit this segment of the market — where the profit margins are so thin that few other companies are willing to compete — because of the massive vineyard and winery infrastructure it has built since its founding in 1973. "It is a big competitive advantage," said Walt Klenz, the former global managing director of Beringer Blass Wine Estates. "Franzia bought a lot [of land and facilities] at the right time and at the right prices." Bronco controls 35,000 acres of California vineyards — more than any other vintner — including its large holdings in Herald, and grows enough grapes to supply 60% of the 27 million cases of wine it produced last year, Franzia said. Bronco's main winery and headquarters in the Central Valley town of Ceres sprawls across 500 acres, including a forest of stainless-steel tanks and fermenters that can hold 82 million gallons, or the equivalent of 410 million bottles, of wine. As production of Two-Buck Chuck outgrew the operations in Ceres, Bronco snapped up a winery in nearby Escalon for about $6 million in 2003; it is spending millions more to upgrade machinery and filtering equipment and expand wine storage capacity there. Bronco also has built a high-speed bottling plant in Napa licensed to process 18 million cases of wine a year, more than twice the annual production of the entire Napa Valley. A tour of Ceres reveals a sophisticated operation capable of processing huge loads of grapes in a short period of time. At the front of the winery, nine large grape presses, each able to handle a 50-ton truckload of fruit, can process 2,400 tons of grapes a day at harvest time. Another bank of presses farther back has the same capacity. So many trucks come through during the grape harvest that there's a 10-acre staging area to handle them all. Automation allows Bronco to reduce the number of workers per shift to about a fifth of what some other wineries use, said Ed Moody, Bronco's director of winemaking, who has worked at other winemakers. "Efficiency is the name of the game," Moody said. "That's how you can get down to $1.99 a bottle." Bronco collected about $500 million in revenue last year and is profitable, Franzia said. He declined to disclose more details about the company, which he owns with brother Joseph Franzia and cousin John Franzia Jr.
"The strength of our company is cash flow. We are sitting with great facilities and vineyards and have no debt," Franzia said. "We have control of our infrastructure from supply to bottling to distribution, and we have shrunk most of the middlemen out of the process." In California, Bronco uses its Classic Wines division to ship its vintages to Trader Joe's, other retailers and restaurants, cutting out wholesalers, which control much of the industry. That relationship with Trader Joe's is a big piece of Bronco's success. Its largest retail customer, the chain sells about $120 million in Bronco wine annually. Trader Joe's declined to discuss its relationship with Bronco except to say that at any given time it is selling Shaw and two or three additional labels from the vintner. "Trader Joe's moves the product, pays us in 10 days and is not greedy about the margins," Moody said. "We don't want to see big markups in our wine. Our business plan is to provide value to the customer. This is a volume business." To cut expenses on the Shaw brand, Bronco uses its own grapes for most of the product. And instead of aging the wine in oak barrels like more expensive vintages, it uses oak wood chips to flavor the wine. When it gets ready to bottle Shaw, Bronco prepares for a two- to three-day run, filling 60,000 cases at a time, more than the annual output of most California wineries. Before Charles Shaw, Bronco was best known as a supplier to Beringer and other large wineries of bulk wine to use for blending into their respective labels. The launch of Charles Shaw wine roiled the industry at a time when it was suffering from a surplus of grapes and falling prices. Franzia used the surplus to his advantage, snapping up higher-quality vintages to blend with his own wine to create a product far better than what the typical consumer expected for $2, said Michaela Rodeno, CEO of St. Supery Vineyards & Winery in Napa Valley and chairwoman of the Wine Market Council. Other vintners tried to jump into the market, but only Bronco has been able to make $2 bottled wine work, Klenz observed, in part because it appealed to the budget gourmet consumers who flock to Trader Joe's. Rival brands sold by supermarket chains never gained the same cachet. Franzia was fortunate, Fredrikson said, to hit the market during "a reverse snobbery trend" that made it "OK to bring Two-Buck Chuck to a dinner party." Already the fourth-largest producer of California wine, Bronco plans to get bigger. The Franzias are considering building a $50-million facility to make red wine on land adjacent to the cooling towers of the shuttered Rancho Seco nuclear power plant southeast of Sacramento. It would handle 200,000 to 300,000 tons of fruit and process 51 million gallons of wine. And having conquered California, Bronco is looking farther afield. The company is steadily building its Europe business: It ships blush wine to British retailing giant Tesco and under the California Winery label now sells more than 250,000 gallons of wine each year in France. Voluble and humorous one minute and cagey the next, Franzia is one of the most controversial figures in California's $15.5-billion retail wine industry. In 1993, Franzia pleaded guilty to intentionally mislabeling 5,000 tons of grapes over a five-year period, a felony. The amount of fruit — labeled as white zinfandel but also containing grenache and colombard varieties — was enough to make 1 million gallons of wine valued at $5 million. Bronco paid a $2.5-million fine. Franzia himself paid a $500,000 fine, stepped down as Bronco's CEO to become the chief financial officer and removed himself from the board of directors for five years. A long-running fight between Franzia, the California Department of Alcoholic Beverage Control and the Napa Valley Vintners trade group over the use of Napa-oriented place names in the labels of some Bronco wine was settled last week. Bronco has lost numerous appeals to the California Supreme Court and the U.S. Supreme Court seeking the right to market wine such as Napa Ridge, Napa Creek and Rutherford Vineyards even though the wine was made with grapes from other regions. Lacking legal options, Franzia has agreed to adhere to California's wine labeling regulations. Despite the legal setbacks, Franzia has earned the grudging respect of many in the industry, in part because of his efforts to improve the quality of California's vineyards. Franzia believes better vineyards lead to better-tasting wine, which would be the state's best protection against imports, which take up more than a quarter of the U.S. market. Last year his company made a 10-year pledge to establish the Bronco Wine Co. Chair of Viticulture at Cal State Fresno. The post places an emphasis on researching and teaching to improve vineyard mechanization and management in the San Joaquin Valley. And only E. & J. Gallo Winery, California's largest winemaker, has given more money to the American Vineyard Foundation since 2001. "Fred is a great businessman," said longtime critic Tom Shelton, CEO of Joseph Phelps Vineyards, "as long as he is playing by the rules."